Discover the 2 basic female body types: Apple and Pear body shapes and why you should eat and exercise differently with an Apple body shape vs. a Pear shape body! Are you fighting that stubborn body fat and would like a customized fat loss plan? Then, you’ll find that the Apple and Pear body shapes system is one of the simplest methods of identifying your body shape. It gives you the specific nutrition and workout routines that help you lose weight and get (or stay) healthy. You’ll see that the Apple and Pear body shapes system is the most practical when you are more than 20 pounds overweight and don’t exercise regularly. Ever wonder why – no matter how much you exercise – your thighs and buttocks hardly get smaller while your breasts become almost invisible? Then, you’ll be pleasantly surprised to find out that with the knowledge about Apple and Pear body shapes you can finally understand what you have to do to lose weight more easily from the bothersome areas. “What do you mean by Apple and Pear body shapes”, you ask? Well, it refers to where you store fat – above the waist, on your upper body (Apple body shape) or below the waist, on your lower body (Pear shape body). Study after study has shown that these two specific female body types is a very accurate predictor of hormonal, metabolic and emotional health. As a result, whether you are Apple-shaped or Pear-shaped it makes a lot of a difference – both in your physiology AND psychology. even respond differently to supplements and medications. So although this could be a new idea to you, if you want better results, your weight loss plan (both diet and workouts) should be personalized to your own female body shape. 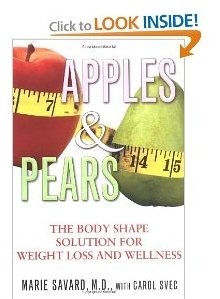 …background on Apple and Pear body shapes medical studies? Did you know that researchers have looked for decades into the connection of Apple and Pear body shapes to various health issues? It’s true; this is not a new fad. In fact, statistics show as well that women with an Apple body shape are at greater health risk than women with a Pear shape body. Well, in the case of an Apple body shape, the normal physiology is greatly affected by a large amount of abdominal (visceral) fat surrounding the internal organs. This results in a host of hormonal and – as a result – metabolic issues. As you can imagine, this causes weight gain and difficulty in losing it – unless certain guidelines specific for Apple body shapes are followed. In contrast, in the case of a Pear shape body the extra fat is deposited (more obviously) directly under the skin, mostly in and around the hips and thighs. As a result, women with a Pear shaped body often struggle with low self-esteem or eating disorder issues (stemming from conflicts with the “ideal” body image imposed by media/society standards) – either of these issues making the weight loss much more difficult. So yes, the term Apple and Pear body – related to these two female body types – has been around for decades. However, only recently scientists verified the strong connection between these two body shapes, their different physiology, health risks and the corresponding weight loss strategies, which are quite different for these two body shapes. 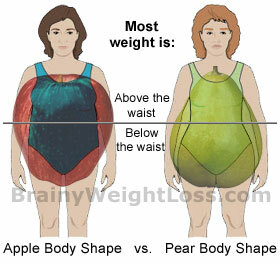 …You Have an Apple Body Shape or a Pear Shape Body? Hold the tape loosely, without applying pressure on your skin and stand up straight, relaxed and without sucking in your tummy. –> If the result is higher than 0.8, you have an Apple shaped body. –> If the result is 0.8 or lower, you have a Pear shape body. An expert on the Apple and Pear body shapes system, Dr. Savard shows you in great detail how to maximize your weight loss and overall health based on your own body shape. This is not just another diet book. The Body Shape Solution to Weight Loss and Wellness shows you what to do to make the most of your physical advantages and avoid the emotional drawbacks of your female body shape so you can lose weight and keep it off easier. You’ll have to forget about the scale. Instead, you’ll discover how to lower your waist circumference to reduce the volume of that dangerous visceral fat pressing on your internal organs and creating havoc with your metabolism. No matter how many weight loss plans have failed you in the past, no matter how many extra pounds you have or how long you’ve gone without taking care of yourself, Apples & Pears Body Shape Solution takes you from this frustrating reality to a slimmer, stronger and much healthier YOU. You’ll be empowered to achieve this in spite of your body shape – if you’re willing to take action to make yourself as healthy as possible through the right diet and exercise routine for your specific body shape. As a result, the extra weight goes away automatically. What I liked most about this book? The constant reminder that you are so MUCH more than the size of your breasts or thighs! But, at the end of the day, it’s your body shape that determines your overall health and – most importantly – how you gain and lose weight.